Is your home gym missing a key component? Push up bars are one of those things that many people don’t even consider purchasing. This is wrong because these pieces of equipment are small (so they don’t take up much space) and manage to do more workouts than you think. In order to determine the very best push up bars, we reviewed a number of the ones available on the market. We looked at a number of different criteria, including size and versatility. If you’re curious about press up bars, keep reading! What Exactly Are Push Up Bars? Before we begin listing the best push up bars, we first need to explain exactly what they are. These bars are also known as press up bars, push up grips, and press up handles. 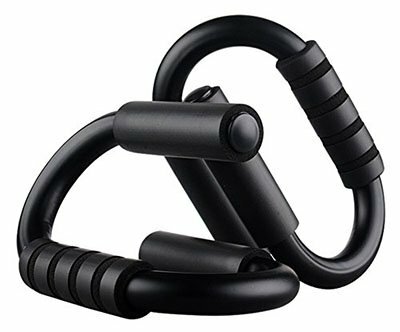 They are great for a home gym because they are small and very efficient to use. Press up bars are metal tools that are sold in pairs. You place them on the floor and situation your body over them, gripping one in each hand. While you may see some people outside of your home gym doing these exercises with barbells, this isn’t recommended. Press up bars are studier and have padded handles, making the exercises easier on your wrists. It’s safe to say that if you have carpal tunnel or some other wrist ailment, you’ll prefer to use press up bars over doing push ups on the floor. When you do push ups on the floor, your wrist is forced to bend at a more extreme angle. This isn’t the case with press up handles. You can even change the angle on some of these devices, making it more comfortable for you. The slightly different exercises (which we go into below) really add versatility to your strength training regimen. These push up grips can be used in many different ways. When shopping for the best push up bars, there are a certain number of characteristics to look for. These include padded foam handles that are slip resistant, as well as rubber foot pads on the bottom that prevent them from slipping mid-exercise. Some press up bars have features like handles that pivot in order to give your arms an additional workout, or adjustable angles so that your push ups are easier on your wrists (this option also provides a different arm workout, based on the overall angles.) Some models easily come apart so that you can take them with you. Others even slide in their bases, making the press ups more difficult and extending the range of exercises even further. In all, you’ll find that these press up bars are a great addition to your home gym for that reason alone. It’s easy to think that the best push up bars only allow you to do one certain exercise – push ups. This is far from the truth. Depending on the model that you choose, you can also do things like chest flies, bench presses, cable crossovers, dumbbell flies, and dumbbell presses. They also work well when holding yourself in the plank position. If you change the angle and distance between your press up handles, you can work out different body parts, as well. Your upper arms, back, chest, entire core, and even your stomach muscles will get a workout. As you can see, these press up handles are so useful that you need them in your home gym. In order to come up with this list of the best push up bars, we reviewed a number of different models. The criteria that we looked at include the overall weight of the press up handles, as well as the hand grips, bottom padding, and any extra features, such as sliding models, rotating ones, changeable angles, and whether or not the push up grips break down for easy transport. Are you ready to see which ones are the best push up bars? The Elite Push Up Bars are on our list of the best push up bars because they are made for comfort. While many people don’t equate workouts with comfort (after all, you can’t really build muscles if you’re comfortable) you’ll find that press up handles that are easy on the wrists can really prevent injuries and pain. The Elite Push Up Bars have handles with rounded edges so that you won’t end up accidentally gouging your hands or wrists mid-workout. They are on the list of the best push up bars for this reason. These push up grips fit firmly on the floor and are held in place with proprietary anti-slip technology. They rotate while you’re doing your push up bar workout in order to give you more flexibility and some additional angles which allow you to hit multiple muscle groups at once. They come fully assembled and weigh a mere 2.4 pounds. Alsp. they are black and have silver accents, meaning that they’ll easily match the rest of your home gym equipment. The JBM Perfect Muscle Push Up Bars are on the list of the best push up bars because they are high quality, yet lightweight. The handles are padded for additional comfort, and they are durable and very lightweight. They also come in several different color combinations, including black, blue, orange, and black and blue, and black and red. 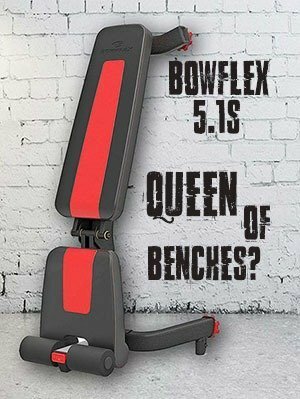 This makes a very interesting addition to your home gym. 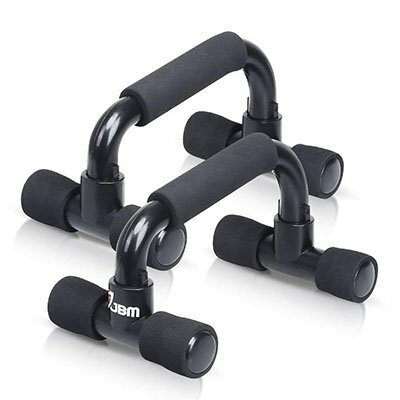 We have placed the JBM Perfect Muscle Push Up Bars in the best push up bars category because they can be gripped at a number of different angles. This allows you to work out more than one muscle group with them. They are compact and portable and are sold in pairs. The JBM Perfect Muscle Push Up Bars measure nine inches long by 5.7 inches wide, and each one weighs a mere 1.3 pounds. This makes these push up grips easy to take with you when you travel. Yes, you can get in some quick push up bar exercises in the comfort of your hotel room. They are made of polypropylene, which is easy to clean, and the handles are coated in slip-resistant rubber. Overall, they can withstand around 225 pounds worth of pressure. 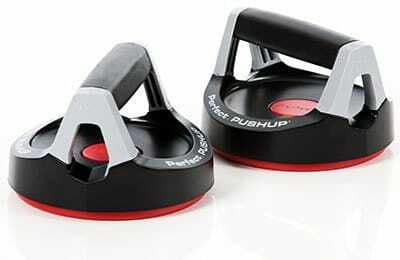 No list of the best push up bars would be complete without the Perfect Fitness Push Up Stands. These colorful press up handles come in a flashy combination of red and black. They’ll definitely stand out in your home gym, making it tough to trip over them when they’re stacked in a corner. The Perfect Fitness Push Up Stands are some of the simplest press up handles on this list. They do not spin, and they can only be used at one angle. This makes them great for beginners. The handles are padded for comfort, and the press up bars are made using Perfect Fitness’ proprietary 360-degree stability. They weigh a total of 7.2 ounces and can be stacked on top of each other so that they don’t take up much space in your home gym. In all, they measure eight inches long by five inches high and five inches wide. The KANSOON Steel Push Up Bars are some of the best push up bars because they are made of sturdy metal and have ergonomic grips. They also support a large amount of weight – upwards of 400 pounds – so you don’t have to worry about them breaking anytime soon. The KANSOON Steel Push Up Bars are a great addition to any home gym. It’s easy to adjust the angle in order to put less stress on your wrists or to change up the muscle groups that you’re working out. The handles are slip resistant and are coated in double foam. Thee push up grips come in black and are made of alloy carbon steel. They measure 7.9 inches by 5.1 inches by 4.7 inches and weigh 1.5 pounds. This means that they take up little space and are easily carried around in a gym bag or suitcase. 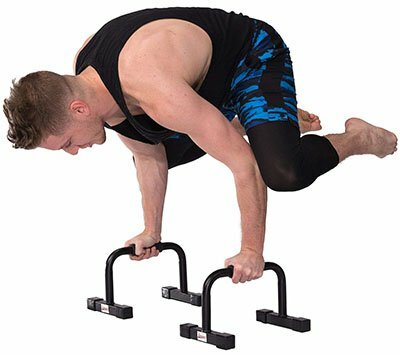 The Kegto Push Up Bars belong on the list of the best push bars because they are sturdy and foldable. Yes, you read that right – you can fold up these press up handles and take them with you everywhere. They are lightweight and compact for just that reason. 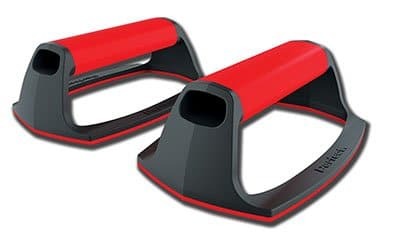 The Kegto Push Up Bars come in a colorful red and black combination. They also come with a nylon bag, as they are designed to be highly portable. These bars have padded foam handles on the top and anti-skid pads on the bottom. They are 6.3 inches by 5.3 inches by 5.1 inches when unfolded. Combined they weigh a total of 1.43 pounds. We’ve placed the Perfect Fitness Perfect Push Up Elite on our list of the best push up bars because they have a highly ergonomic design and rotate slightly in order to work more muscle groups with each lift. 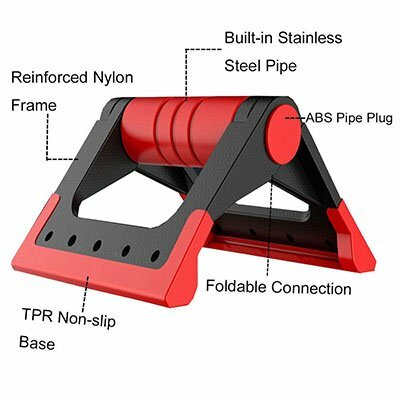 These press up handles come in a red and black and are designed to prevent wrist strain. 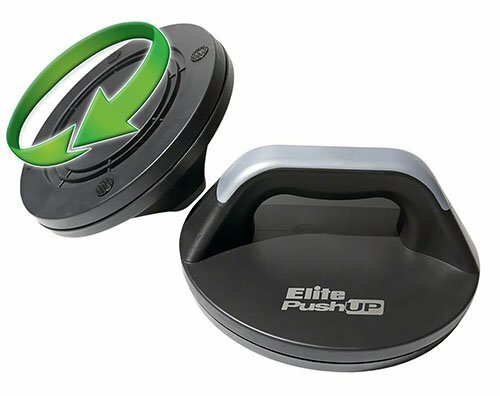 The Perfect Fitness Perfect Push Up Elite have a steel ball bearing system on the inside to make those rotations smooth and even. The bottoms of the handles have built-in treads for easy and secure floor adhesion, and they can withstand up to 400 pounds of weight. In all, the measure 12 inches by 12 inches by 12 inches and weigh one pound. The Juperbsky Push Up Stands are some of the best push up bars because they are extremely durable. They can support up to 2,200 pounds worth of weight. You can perform numerous types of workouts with them, including gymnastics handstands and v-sits. The Juperbsky Push Up Stands are a very interesting pair of press up bars. They are very high up off of the floor (5.5 inches) which enhances the number of exercises that you do on them. They come in plain black or a black and violet combination, meaning that they’ll fit almost any home gym décor. These press up handles are 12 inches long and seven inches wide, and they weigh 5.7 pounds combined. Your home gym needs a good set of press up handles (or, depending on your desired workout, a sliding device that works the same way.) The ones on this list are what we think are the best push up bars. They are all versatile, well made, and consist of high tech materials. You’ll find that the models we’ve reviewed here are very useful. We highly recommend that you add a set of these to your home gym.